1. Massachusetts governor Mitt Romney stands by comments about Muslims. In the Iranian Mullahs we have past-masters at the game of deception to play against! So we can safely discount all that the mullahs say. When they mean "Yes" they say "No" and when they say "No", they mean "Yes". It is a safe bet to assume that they are feverishly working towards a nuclear arsenal to be used against us. They are offerring us negotiations and a pact which many countries would be a party to. Their Prophet Mohammed had started this tradition of deception through treaties with the Treaty of Hudaibiya. The Mullahs as his progenitors are merely following what that despicable gangster had started in the 7th century. Having said that, the only positive outcome of the Iranian Mullah regime being at the UN is its baring its breast to the World body and openly declaring that it intends to pursue nuclear technology and also to proliferate it. The West seems to be about to put up a common front to call the Iranian Mullahs' bluff. Now with the French Government having made the first noises of referring the Iranian case to the UN Security Council, what has been set in motion is the logical outcome of such reference. 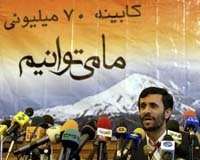 Sanctions on Iran will follow, and despite sanctions, the Mullah regime will press ahead with its destructive designs. And once, France Britain, Russia, and hopefully China too from the Veto wielding Permanent members of the Security Council are all on board the ball will be set rolling towards military action against Iran in the course of time. And after other countries like Italy, Australia, Germany (now that Angela has been elected Chancellor), Japan, India are also enrolled in the anti-Mullah line up, the die will be cast. And then no country worth its name would want to back out from this course. The French too will have to commit troops for the military action against Iran, as they did in Afghanistan and also earlier in Iraq in 1991. The fact that we have started moving towards this goal, has been the one single positive outcome of the 60th birthday bash of the United Nations Organization at New York. U.S. diplomatic sources remained firm that the United States still believes Iran has a clandestine atomic weapons plan and that a referral to the U.N. Security Council is forthcoming unless Iran stops processing uranium at Isfahan and returns to the negotiating table with the E.U.-3. Events are following the course I saw while writing "Atomic Iran." Yesterday, Russia placed a statement on the English version of the Ministry of Foreign Affairs website commenting on the IAEA report and signaling Russia sees "no grounds for the referral to the U.N. Security Council of the question which the IAEA is actively and productively concerned with at present." France and China, both permanent members of the U.N. Security Council, can also be expected to oppose bringing Iran to the Security Council. The problem is that Iran is defying the E.U.-3 by refusing to negotiate any further unless the negotiations proceed under an understanding that Iran has a right to process uranium under the terms of the NPT. Right now, Iran sees clear tactical advantage to leading the radical Islamic revolution's charge against the United States. The mullahs have not yet opened the centrifuge farms at Natanz for one simple reason: They need some more time to process uranium at Isfahan before they have enough uranium hexafluoride to make starting up the centrifuges worthwhile. Reports coming out of Iran suggest that some 7 to 10 tons of uranium hexafluoride have already been produced in Isfahan since the facility was restarted around Aug. 8. Still, that is enough uranium-235 to produce only about one small atomic bomb. Once the Iranians have enough uranium hexafluoride to produce five to 10 bombs, we should expect the mullahs to start up Natanz. Why are the mullahs being so defiant? They have come to the conclusion that the United States is weak and unable to stop them. The mullahs are watching the internal political criticism the president is facing from the Left over Iraq. Every argument from the political Left that Iraq is another "Vietnam quagmire" convinces the mullahs that President Bush lacks the political strength to launch a military attack on Iran.